With “Solo: A Star Wars Story” proving an intergalactic dud on its opening weekend, analysts have been pondering whether Lucasfilm’s enviable license to print money might just have expired. The latest prequel in the iconic space franchise opened over the Memorial Day weekend in the US and Canada on just $103 million, worryingly short of predictions of a $150 million debut. The news abroad was arguably worse, leaving Oscar-winning veteran filmmaker Ron Howard’s contribution to the “Star Wars” universe barely halfway toward the predicted $300 million opening global take. “By any other movie’s standards, this would be a home run,” comScore senior media analyst Paul Dergarabedian told AFP. “In the world of ‘Star Wars,’ where the expectations are so high and interest rises to a fever pitch, it’s being universally called a disappointment or an underwhelming performance.” “Solo,” starring 28-year-old Alden Ehrenreich (“Hail Caesar!”) in the title role, charts the adventure-filled past of smuggler Han Solo-made famous in four “Star Wars” movies by Harrison Ford. The second of three planned spinoffs from Disney-owned Lucasfilm, it follows “Rogue One: A Star Wars Story,” the second highest grossing movie worldwide in 2016. It has endured a journey to screen as treacherous as a picnic on a windy day in the Tatooine desert, with directing duo Phil Lord and Chris Miller sacked by Lucasfilm over “creative differences” far into the production. Another inconvenient personnel change that may have put pressure on the reported $250 million budget was the withdrawal of Michael K. Williams, who had been tapped to play the main villain but had to pass the part on to Paul Bettany because of a scheduling conflict. 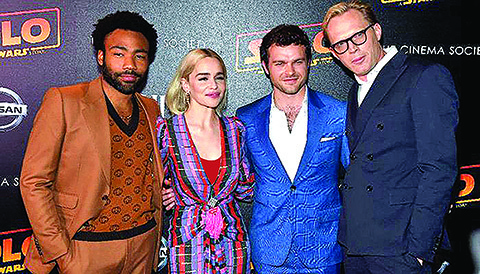 “’Solo’ had to endure a year’s worth of bad press,” Shawn Robbins, chief analyst at Boxoffice.com, told AFP. “Speculation ran rampant after myriad confirmed and unconfirmed stories relating to why Lucasfilm switched gears and changed directors near the end of production-reportedly resulting in 70 percent of the film being reshot.” Howard is generally credited with having done a decent job at short notice, however, and the problem for analysts isn’t necessarily the quality of what ended up on screen. Han Solo’s origin story, Robbins argues, turned off fans because it didn’t connect directly to the overarching mythos of the main saga, whereas “Rogue One” dovetails directly onto 1977’s “A New Hope.” “A lot of people had made up their minds about this movie months before it even came out. It just wasn’t clear how significant a portion of the fan base that was until now,” Robbins said. “Despite the durability of the brand name, the film simply wasn’t able to overcome the negative headlines and fan outcries that have gestated-whether or not one agrees with them-since Disney took over the franchise.” Another potent factor might well have been “Star Wars fatigue,” say analysts, 40 years into a series that kept respectable three-year gaps between episodes in the original and prequel trilogies. The trilogies themselves-the original films, the prequels and the sequel series due to wrap up in 2019 — were also launched a long time apart, with gaps of 16 and then 10 years. Disney paid “Star Wars” creator George Lucas $4 billion for Lucasfilm in 2012, and has already brought out no less than four movies, starting with 2015’s “The Force Awakens.” “Solo” came out with “The Last Jedi”-the eighth movie in the main saga still playing in some foreign markets and having only just ended its US theatrical run a month earlier. Robbins and Dergarabedian both refer to the stuttering start made by “Solo” as a rock or bump in the road, arguing that the franchise is still in good health. “It’s easy to Monday morning quarterback for all of us. For Disney, they’re putting it all on the line and they’re going to take these lessons learned from this weekend and apply them,” Dergarabedian said.